On Monday, September 10 at 6:40 p.m., the North Manchester Historical Society will host C. Russell Baker, who will present a program on the Kendallville Museum. 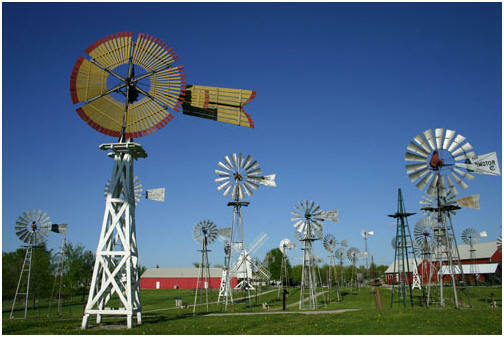 The mission of this distinctive outdoor museum is to provide a museum to collect, display, preserve, and tell the story of wind power from its origination through the American Windmill to the present day. The program will be held in the Assembly Room of Timbercrest Senior Living Community, 2201 East Street. Russell Baker is a founding member of the museum, and has been a major factor in its growth and development. He is extremely knowledgeable about the manufacture of windmills in north central Indiana. During the infancy of the windmill industry from 1875 to 1900, our area hosted many companies that manufactured windmills, including the Rex Windmill Company in North Manchester. Area inventors also received patents that significantly improved the device. Windmills are a self-governing labor saving invention that played a significant role in pioneer life. The Kendallville museum features 52 windmills ranging from the familiar ones we all know to some unusual varieties. One windmill of local significance was the dramatic 25 to 30-foot diameter windmill in Liberty Mills. People on holiday would take the train to that town to see the sight. The public is also invited to come to the Assembly Room at 6 p.m. for a meal prior to the meeting. For those who wish to attend the dinner, reservations must be made no later than noon on Friday, September 7. The cost of the meal is $7.50. Reservations may be made by calling Mary at 260-982-1813 or Evelyn at 260-982-6777. There is not cost for the program, which is free to the public. All are welcome.